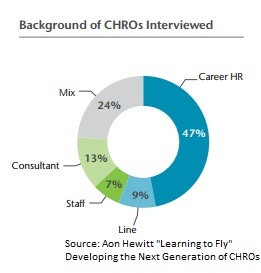 Many current chief human resource officers (CHROs) have professional backgrounds outside of HR. A recent study by Aon, which captured insights from 45 CHROs at leading global organizations, revealed that more than half are not career HR professionals. Of these, approximately a third had no background in HR prior to assuming their current CHRO position. This trend of finance or other functions controlling the CHRO position began during and in the immediate aftermath of the Great Recession. The question now is, will it continue? That’s unlikely – at least according to some next-generation executive search experts. From their perspective, the pendulum already is beginning a swing back toward career human resources professionals dominating the CHRO ranks of the near future. There are exceptional CHROs now with communications, accounting and finance backgrounds – but this will not become the norm. More than ever, managing talent means understanding multiple social and cultural factors, while also ensuring that employees are aligned with an organization’s business goals. The depth and breadth of ability required to achieve this on a consistent basis simply won’t belong to someone who has not spent years honing their skills in various human resources positions. Certainly, sideways functional moves are common, even favored, within some companies related to senior executive development. But, no two roles are exactly alike, and developing an understanding of the supply chain or grasping the nuances of customer interaction are quite different from assuming responsibility for management of human capital and all related planning. To succeed early in their careers, finance and accounting executives must be naturally analytical and cultivate an unwavering return-on-investment focus as they develop strategy. But human resources requires a different set of skills, with an emphasis on empathy and the capacity to strategically maximize each employee’s talent, whatever their role in the workforce. While a dose of science is necessary, there’s also psychology, creativity, and even – at least among the profession’s elite — some intuition. Along with natural inclination, these abilities cannot be developed to an expert level except through years of experience within the human resources sector. A move between functions may be appropriate for the chief operating officer or chief marketing officer, but it is not something advisable for the CHRO. It just is not a natural path, and it isn’t in the best interests of the organization or the individual professional. HR leaders coming up through the ranks these days are more commercially minded, not just tuned into talent management but business strategy as well. Mark is responsible for evolving Marlin Hawk’s service offering and ensuring that we maintain our competitive edge through innovation and excellence. Based in New York, Mark has been the driving force behind the creation and growth of Marlin Hawk in The Americas. He has become a true ally to many of the biggest companies and best known brands, acting as a strategic advisory partner as well as completing a host of high profile placements across a diverse range of sectors and functions. His launch of our market intelligence function has enabled clients to access timely and exclusive information that has transformed their business and revolutionized the way they have worked with search firms. Before joining Marlin Hawk in 2006, Mark developed sourcing strategies for leading global consumer businesses. He graduated with a first-class honours degree in Econometrics from Notthingham University, UK.